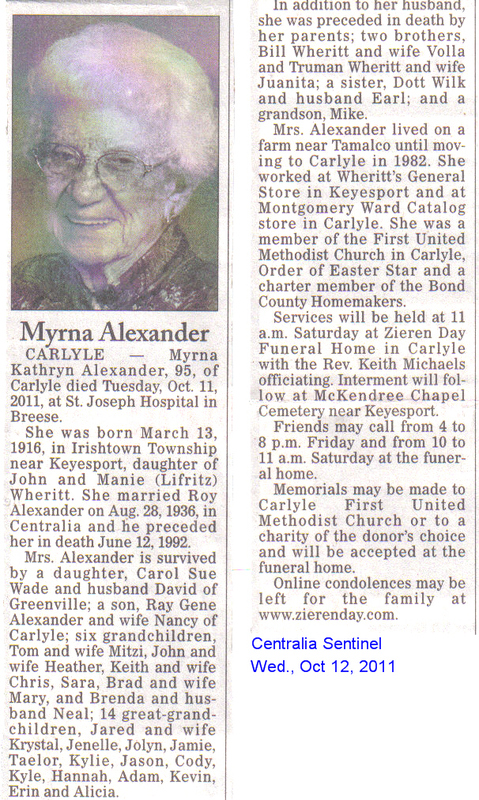 Myrna Kathryn Alexander, 95, of Carlyle died Tuesday, Oct 11, 2011, at St. Joseph Hospital in Breese. She was born March 13, 1916, in Irishtown Township near Keyesport, daughter of John and Manie (Lifritz) Wheritt. She married Roy Alexander on Aug. 28, 1936, in Centralia and he preceded her in dath June 12, 1992. Mrs. Alexander is survived by a daughte, carol Sue Wade and husband David of Greenville; a son, Ray Gene Alexander and wife Nancy of Carlyle, six grandchildren, Tom and wife Mitzi, John and wife Heather, Keith and wife Chris, Sara, Brad and wife Mary, and Brenda and husband Neal; 14 great-grandchildren, Jared and wife Krystal, Jenelle, Jolyn, Jamie, Taelor, Kylie, Jason, Cody, Kyle, Hannah, Adam, Kevin, Erin and Alicia. In addition to her husband, she was preceded in death by her parents; two brothers, Bill Wheritt and wife Volla and Truman Wheritt and wife Juanita; a sister, Dott Wilk and husband Earl; and a grandson, Mike. Mrs. Alexander lived on a farm near Tamalco until moving to Carlyle in 1982. She worked at Wheritt's General Store in Keyesport and at Montgomery Ward Catalog store in Carlyle. She was a member of the First United Methodist Church in Carlyle, Order of Easter Star and a charter member of the Bond County Homemakers. Services will be held at 11 a.m. Saturday at Zieren Day Funeral Home in Carlyle with the Rev. Keith Michaels officiating, interment will follow at McKendree Chapel Cemetery near Keyesport. Friends may call from 4 to 8 p.m. Friday and from 10 to 11 a.m. Saturday at the funeral home. Memorials may be made to Carlyle First United Methodist Church or to a charity of the donor's choice and will be accepted at the funeral home. Online condolences may be left for the family at www.zierenday.com. Roy Alexander, 80, or Carlyle, died Friday at St. Elizabeth's Hospital in Belleville after an extended illness. Mr. Alexander was born in Tamalco Township Sept. 11, 1911, the son of Richard and Pearl (Apple) Alexander. 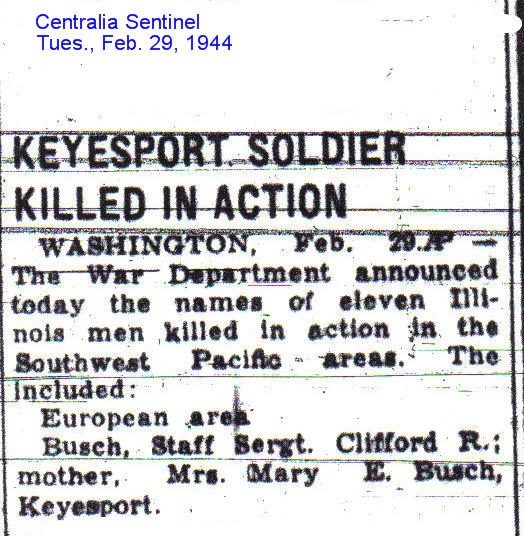 He married Myrna Kathryn Wheritt Aug. 28, 1936, in Centralia, and she survives. Also surviving are a son, Ray Gene Alexander of Carlyle; a daughter, Carol Sue Wade of Greenville; a brother, Byrl Alexander of Greenville; six grandchildren and three great-grandchildren. Mr. Alexander was a lifelong area resident and a farmer, retiring in 1982. He was a member of the Carlyle Community Unit District No. 1 Board of Education, Farm Bureau, Scott Lodge No. 79 AF & AM, Order of the Eastern Star No. 518 of Carlyle and the Methodist Church. The Rev. John Vidakovich will officiate at funeral services at the Zieren-Day Funeral Home at 11 a.m. Monday. Interment will follow at the McKendree Chapel Cemetery near Keyesport. Friends may call at the funeral home after 4 p.m. Sunday or from 8 a.m. Monday until time of services. Memorials may be made to the Carlyle United Methodist Church or to the donor's choice and will be accepted at the funeral home. Clarence W. "Bob" Barackman, 75, of Keyesport, died suddenly yesterday at his home. Mr. Barackman was born in Keyesport, the son of Walter and Elizabeth (Knutt) Barackman. In 1937, at Irishtown, he married Norine Vogel, who survives. Other survivors include a daughter, Mrs. Marlene Payne; and a granddaughter. Mr. Barackman was a maintenance custodian at Keyesport Grade School for 25 years, retiring in January, 1973. He was a member of the Keyesport Senior Citizens. Funeral services will be 1:30 p.m. Thursday at the Keyesport United Methodist Church with Rev. Ed Schmulbach and Rev. L. Joseph Scheets officiating. Burial will be at McKendree Chapel in Keyesport. Friends may call after 4 p.m. tomorrow and before 11 a.m. Thursday at the Zieren-Day Funeral Home in Carlyle. Shirley McClaren Beyes, 53, of Carlyle, died on Sunday, Nov. 28, 1999, at her residence after and extended illness. She was born in Breese on Feb. 23, 1946, daughter of Edward and Norma (Fisher) McClaren. Survivors include a daughter, Karla Joiner and husband Machon of Springfield, Mo. ; a brother, Jim McClaren and wife Marsha of Carlyle; a sister, Cheryl Reymond and husband Roger of Greenville; a special friend, Marty O'Brien of Carlyle and two grandchildren, Krystal and Kourtney Joiner. Mrs. Beyes lived in Cameron, Mo. until last year when she moved back to Carlyle. She worked as a secretary and bookkepper for Glenn's radiator and Wrecker in Cameron, Mo. Services are 11 a.m. Tuesday at Zieren Day Funeral Home in Carlyle with the Rev. Tom Rankin officiating. Interment will follow in McKendree Chapel Cemetery in Keyesport. Friends may call from 4 to 8 p.m. today and from 8 to 11 a.m. Tuesday at the funeral home. Memorials may be made to the charity of the donor's choice and they will be accepted at the funeral home. Edna Boatright, 91, of Keyesport, died this morning at St. Joseph's Hospital in Breese. She was born in Irishtown Township in Clinton County, daughter of John and Anna (Hartmann) Buck. In 1917 she married Glen Boatright in Carlyle and he preceded her in death. Survivors include a son, Nyle Boatright of Keyesport; a sister, Hazel Larson of Tavares, Fla.; five grandchildren and six great-grandchildren. Mrs. Boatright lived in the Keyesport-Carlyle area all her life. She was a member of the Methodist Church, the Rebekah Lodge and the Club of the Month. Funeral services will be held Sunday at 1:30 p.m. at Zieren-Day Funeral Home in Carlyle with Rev. Ed Schulbach officiating. Burial will be in mcKendree Chapel Cemetery. Friends may call at the funeral home after 3:30 p.m. tomorrow. Kenneth Brown, 72, of Carlyle, died Thursday morning at Bresse Nursing Home. He was born in Irish Town Township on Feb. 11, 1915, the son of Porter and Agnes (Golder) Brown. He married Fern Cole Aug. 10, 1942, in Louisville, and she survives. Other survivors include two sons, Robert Brown and Wilson Brown, both of Carlyle; a brother Leroy Brown of San Diego, Calif.; and five grandchildren. 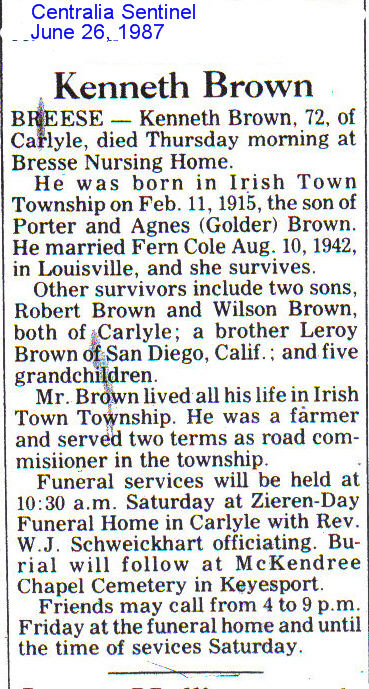 Mr. Brown lived all his life in Irish Town Township. He was a farmer and served two terms as road commissioner in the township. Funeral services will be held at 10:30 a.m. Saturday at Zieren-Day Funeral Home in Carlyle with Rev. W.J. Schweickhart officiating. Burial will follow at McKendree Chapel Cemetery in Keyesport. Friends may call from 4 to 9 p.m. Friday at the funeral home and until the time of services Saturday. Busch, Staff Sergt. Clifford R.; mother, Mrs. Mary E. Busch, Keyesport. Martha Elizabeth Carman, 76, of Keyesport, was pronounced dead on arrival this morning at Utlaut Memorial Hospital in Greenville. She was born in Patoka, daughter of Wallace and Cora Jane (Alexander) Cooper. In 1922 in Patoka she married Claude Carman. Survivors include her husband; a son, Donald of Keyesport; two daughters, Ruby Bretz of Carlyle and Bonnie Carver of Keyesport; eight grandchildren and 13 great-grandchildren. Mrs. Carman was a member of the United Methodist Church in Keyesport, Royal Neighbors Encampment of Keyesport and Sunlight Rebekah Lodge 769 of Keyesport. Funeral services will be held Wednesday at 2 p.m. at the United Methodist Church in Keyesport with Rev. Ed Schmulbach officiating. Burial will be in McKendree Chapel Cemetery. Friends may call at Zieren-Day Funeral Home in Carlyle after 3:30 p.m. tomorrow and until 11 a.m. Wednesday, then at the church from noon until the services. Nellie Carter, 86, of Keyesport, died Thursday at St. Elizabeth's Hospital in Belleville. She was born in Clinton County on Dec. 2, 1900, daughter of William and Nellie Apple. She married Burl Carter in Carlyle on June 26, 1922, and he died April 18, 1975. Nieces and nephews survive. Graveside services will be held Saturday at 10 a.m. at McKendree Chapel Cemetery near Keyesport. Frerker Funeral Home of Carlyle is in charge of arrangements. There will be no visitation. Ivah V. Carver, 79, of Keyesport died Thursday afternoon, April 10, 1997, at Utlaut Memorial Hospital in Greenville. She was born Aug. 16, 1917, in Dudleyville, daughter of Joseph and Margaret (Kuntz) Jennings. 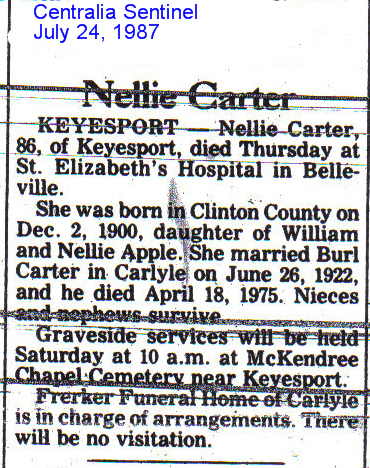 She married John Carver on Feb. 16, 1932, in Carlyle, and he preceded her in death on Jan. 29, 1987. Survivors include two sons, Ralph Carver and Melvin Carver, both of Keyesport; one sister, Evelyn Klein of Trenton; five grandchildren; and six great-grandchildren. Mrs. Carver was a homemaker. Services are 11 a.m. Saturday at Zieren Day Funeral Home in Carlyle with the Revs. Tom Hoffmann and Jerome Feldmann officiating. Interment will follow in McKendree Chapel Cemetery. Friends may call 4 to 8 p.m. today and 8 a.m. until time of services Saturday at the funeral home. Memorials may be made to McKendree Chapel Cemetery and will be received at the funeral home. 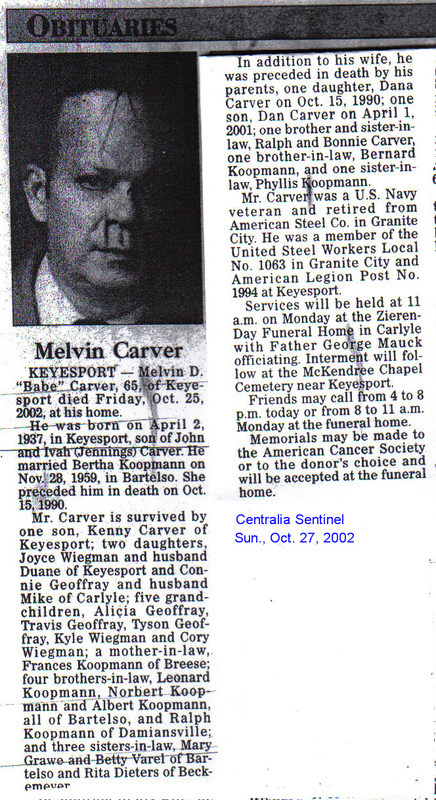 Melvin D. "Babe" Carver, 65, of Keyesport died Friday, Oct 25, 2002, at his home. He was born on April 2, 1937, in Keyesport, son of John and Ivah (Jennings) Carver. He married Bertha Koopmann on Nov. 28, 1959, in Bartelso. She preceded him in death on Oct. 15, 1990. Mr. Carver is survived by one son, Kenny Carver of Keyesport; two daughters, Joyce Wiegman and husband Duane of Keyesport and Connie Geoffray and husband Mike of Carlyle; five grandchildren, Alicia Geoffray, Travis Geoffray, Tyson Geoffray, Kyle Wiegman and Cory Wiegman; a mother-in-law, Frances Kiipmann of Breese; four brothers-in-law, Leonard Koopmann, Norbert Koopmann and Albert Koopmann, all of Bartelso, and Ralph Koopmann of Damiansville; and three sisters-in-law, Mary Grawe and Betty Varel of Bartelso and Rita Dieters of Beckemeyer. In addition to his wife, he was perceded in death by his parents, one daughter, Dana Carver on Oct. 15, 1990; one son, Dan Carver on April 1, 2001; one brother and sister-in-law, Ralph and Bonnie Carver, one brother-in-law, Bernard Koopmann, and one sister-in-law, Phyllis Koopmann. Mr. Carver was a U.S. Navy veteran and retired from American Steel Co. in Granite City. He was a member of the United Steel Workers Local No. 1063 in Granite City and American Legion Post No. 1994 at Keyesport. Services will be held at 11 a.m. on Monday at the Zieren-Day Funeral Home in Carlyle with Father George Mauck officiating. Interment will follwo at the McKendree Chapel Cemetery near Keyesport. Friends may call from 4 to 8 p.m. today or from 8 to 11 a.m. Monday at the funeral home. Memorials may be made to the American Cancer Society or to the donor's choice and will be accepted at the funeral home. Estella G. DeLay, 89, of Carlyle, died Thursday at Greenville Garden Care Center. She was born Dec. 24, 1901, in Irishtown Township, daughter of Walter and Ida Jane (Newkirk) Essington. She married Bert DeLay in 1922 and he preceded her in death in 1952. Surviving are a daughter, Marjorie Day of Sandoval, two grandsons, five great-grandchildren and two stepgreat-grandchildren. Mrs. DeLay was a school teacher in rual Keyesport schools and Carlyle District No. 1 until her retirement in 1964. She was a member of the Hopewell Methodist Church and Clinton County Farm Bureau and a 50-year member of Sunlight Rebekah Lodge No. 769 in Keyesport. Funeral services are 11 a.m. Saturday at the Zieren-Day Funeral Home in Carlyle with the Rev. Elmer Fenton officiating. Burial will be in McKendree Chapel Cemetery. Vistitation will be from 4 to 9 p.m. Friday at the Zieren-Dayk Funeral Home and 8 a.m. until the time of services Saturday. Memorials may be made to the Hopewell Methodist Church and will be accepted at the funeral home. Cleo A. Dieckman, 92, of Breese, formerly of Keyesport, died yesterday at the Breese Nursing Home. She was born in East Fork Township in Clinton County, the daughter of Frank and Josephine (Brooks) Cole. She married Henry Dieckman on Dec. 24, 1910, at St. Louis and he preceded her in death on April 6, 1972. Survivors include two daughters, Dorothy Isaak of Carlyle, and Waneta Schwierjohn of Germantown; a son, Franklin Dieckman of Keyesport; a brother, George Cole of Huey; a sister, Margaret Kennedy of Elgin; seven grandchildren, eight great-grandchildren, and one great-great-grandchild. She was a homemaker, a lifelong resident of the Keyesport area, a member of the Keyesport Christian Church and a former board member at the church. Funeral services have been scheduled for Saturday at 11 a.m. at the Zieren-Day Funeral HOme in Carlyle. Burial will be in the McKendree Cemetery near Keyesport. Friends may call tomorrow after 3 p.m. at the funeral home. Mrs. Bessie V. Duncan, 83, of Keyesport, died late Thursday evening at her home. Mrs. Duncan was born in Irishtown Township in 1896, the daughter of Thurston and Edith (Malone) Rea. She married Frank Duncan in 1914. He preceded her in death. Surviving are a son, Ernest Duncan of Dunbar, W. Va.; two daughters, Mrs. Oma Hintz of rural Shattuc and Mrs. Zelma Isaak of Keyesport; a brother, Roy Rea of Trenton; three sisters, Mrs. Mary Operle of Belleville, Mrs. Eula Mason of Centralia, and Mrs. Edith Waggner of East St. Louis; six grandchildren, one step-grandchild and 16 great-grandchildren. Funeal services will be conducted at 1 p.m. Monday at the Zieren-Day Funeral Home in Carlyle. Interment will follow at the McKendree Chapel Cemetery at Keyesport. Friends may call at the funeral home after 4 p.m. today. Delores Edwards, 69, of Urbana, formerly of Keyesport, died yesterday in Urbana following an extended illness. 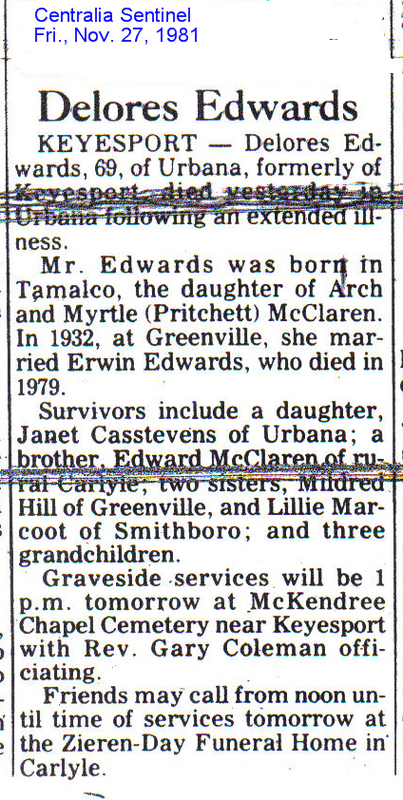 Mrs. Edwards was born in Tamalco, the daughter of Arch and Myrtle (Pritchett) McClaren. In 1932, at Greenville, she married Erwin Edwards, who died in 1979. Survivors include a daughter, Janet Casstevens of Urbana; a brother, Edward McClaren of rural Carlyle; two sisters, Mildred Hill of Greenville, and Lillie Marcoot of Smithboro; and three grandchildren. Graveside services will be 1 p.m. tomorrow at McKendree Chapel Cemetery near Keyesport with Rev. Gary Coleman officiating. Friends may call from noon until time of services tomorrow at the Zieren-Day Funeral Home in Carlyle. Bobby Neal Essington, 71, of Stewardson and fomerly of Keyesport, died Wednesday, Dec. 14, 1994, at his home following a sudden illness. He was born Jan. 3, 1823, at Keyesport, son of Walter and Rosella (Myatt) Essington. He maried Polly Ward on Dec. 16, 1946, at Springfiled, Ohio, and she preceded him in death in 1993. Survivors include his mother, Rosella Essington of Effingham; one brother, Jerry Essington of Washington; and nieces and nephews. Mr. Essington was a truck driver for Moomaw Trucking until his retirement. He had lived in Stewardson since 1975. He was a member of Veteran of Foreign Wars Post 3523 of Carlyle, and American Legion Post of Stewardson. He was a U.S. Army veteran of World War II, having served in Africa and the European Theater. Services are 10 a.m. Saturday at Zieren Day Funeral Home in Carlyle with the Rev. Thomas Hoffmann officiating. Interment will follwo in McKendree Chapel Cometery near Keyesport. Friends may call 6 to 8 p.m. today and 8 a.m. until time of service Saturday at the funeral home. Memorials may be made to American Heart Association and will be received at the funeral home. Thomas G. Essington, 85, Carlyle, died last night at Twin Willows Nursing Home, Salem, following a lengthy illness. He was born July 11, 1884 in Clinton County, the son of Hugh and Amelia (Russell) Essington. He married Katie Cummins at Carlyle, May 22, 1907 and she died in 1968. Surviving are two daughters, Mrs. Sara Diffenaur of St. Louis and Mrs. Opal Hudelson of Carlyle; four sons, Thomas W. and Robert D. of Carlyle, Lloyd E. of Jacksonville and Elvin Essiington of Tamalco; 11 grandchildren and seven great-grandchildren. Funeral arrangements are incomplete and will be announced later from the Frerke Funeral Home, Carlyle. Walter M. Essington, 80, of Carlyle, died yesterday at 9:56 a.m. at St. Joseph's Clinton County Hospital in Breese after an extended illness. He was born in Irishtown Township in Clinton County, son of Walter Hugh and Ida Jane (Newkirk) Essington. In 1922, he married Rosella Myatt in Venice. Survivors include his wife; two sons, Bobby Neil of Stewardson and Jerome M. of Washington; a sister, Estella Delay of R.R. 1, Carlyle, and three grandchildren. Mr. Essington moved to Carlyle in 1958. He had farmed in Irishtown Township and worked for Brown Shoe Co. He was a member of the United Methodist Church. Funeral services will be held tomorrow at 2 p.m. at Zieren-Day Funeral Home in Carlyle with Rev. David Myers officiating. Burial will be in McKendree Chapel Cemetery. Friends may call at the funeral home after 2:30 p.m. today. Fern A. Finley, 90, a resident of Centralia Care Center and formerly of 727 N. Hickory, died yesterday at 4:05 a.m. at St. Mary's Hospital. She was born in Walnut Hill on Jan. 12, 1895, daughter of Alfred and Charity (Copple) Corners. She married Jessie H. Finley in Keyesport and he died in 1957. Survivors include a son, Cecil L. Finley of Centralia; five grandchildren and 11 great-grandchildren. 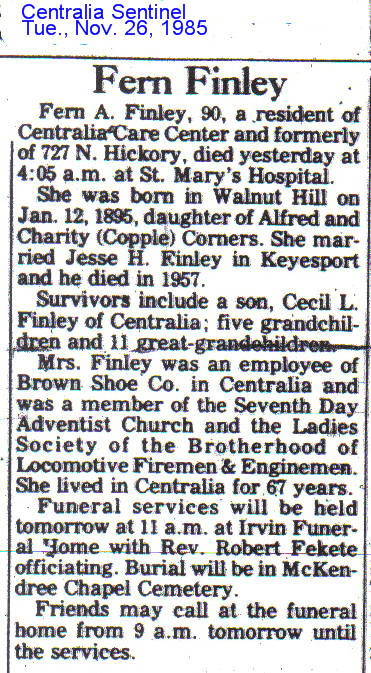 Mrs. Finley was an employee of Brown Shoe Co. in Centralia and was a member of the Seventh Day Adventist Church and the Ladies Society of the Brotherhood of Locomotive Firemen & Enginemen. She lived in Centralia for 67 years. Funeral services will be held tomorrow at 11 a.m. at Irvin Funeral Home with Rev. Robert Fekete officiating. Burial will be in McKendree Chapel Cemetery. Friends may call at the funeral home from 9 a.m. tomorrow until the services. Lenora Finley, 68, of Brookside Manor Nursing Home, died at 6:04 a.m. today at St. Mary's Hospital follwoing a sudden illness. Born at Keyespport, Mrs. Finley was the daughter of Jesse H. and Fern A. (Corners) Finley. She married William Marshall Finley on July 1, 1939, at St. Charles, Mo., and he preceded her in death on Oct 2, 1974. Mrs. Finley worked for the Oneida Paper Products at entralia and had lived here since ____. She was a member or the Seventh-day Adventisst Church and the AARP. Survivors include her mother, Fern A. Finley of Centralia; two sons, Gary N. Finley of Beardstown and Billy J. Finley of Centralia; a brother, Cecil Finley of Centralia; and three grandchildren. Funeral services will be conducted at 3:30 p.m. Sunday at the Irvin Funeral Home with Pastor Robert Fekete officiating. Burial will be at McKendree Cemetery at Keyesport. Friends may call from 6 p.m. until 9 p.m. tomorrow at the funeral home and after 8 a.m. SSunday until the time of services. Mrs. Mildred O. Finley, 71, of St. Louis, Mo., a former resident of Keyeseport, died early yesterday at Deaconess Hospital in St. Louis. 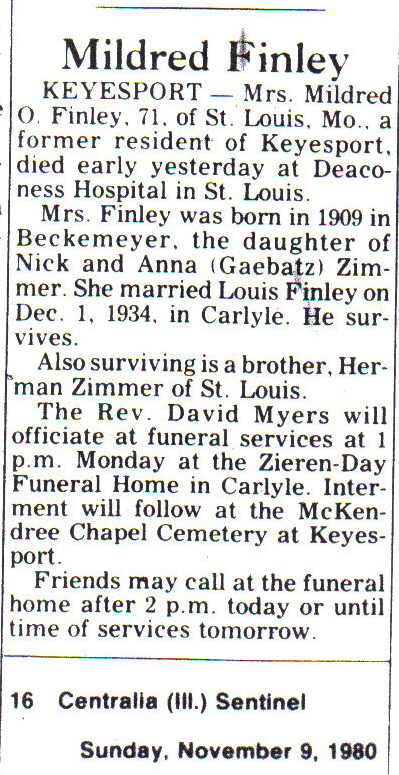 Mrs. Finley was born in 1909 in Beckemeyer, the daughter of Nick and Anna (Gaebatz) Zimmer. She married Louis Finley on Dec. 1, 1934, in Carlyle. He survives. Also surviving is a brother, Herman Zimmer of St. Louis. The Rev. David Myers will officiate at funeral services at 1 p.m. Monday at the Zieren-Day Funeral Home in Carlyle. Interment will follow at the McKendree Chapel Cemetery at Keyesport. Friends may call at the funeral home after 2 p.m. today or until time of services tomorrow. Fern F. Harris, 98, or DeSoto, Kan., formerly of Keyesport and Greenville, died peacefully on Thursday, Dec. 29, 2011. She was born Sept. 19, 1913, in Wisetown, Beaver Creek area, daughter of Charles Albert Sanders and Eathel Nola Willmirth Sanders. She married Alfred G. Harris on Sept. 30, 1934, and he preceded her in death in 1963. Mrs. Harris is survived by two sons, Bill Harris and wife Brenda of Louisburg, Kan., and Bob Harris and wife Rayma of Carlyle; one daughter, Gloria Harris Williams and husband Dennis of Flemington, Mo. ; seven grandchildren; 11 great-grandchildren; and four great-great-grandchildren. In addition to her husband, she was preceded in death by four brothers and four sisters. Mrs. Harris was a member of the First Christian Church of Greenville and enjoyed volunteering at the church. She was a member of the Rebecca Lodge of Keyesport for many years. She and her husband resided in and raised their family in Keyesport until 1968, when she moved to Greenville. She enjoyed making beautiful quilts, baking fair-winning banana bread, playing bingo with her friends, and helping with the women's auxiliary in Greenville. Services will be held at noon Tuesday at Zieren Day Funeral Home in Carlyle. Interment will follow at McKendree Chapel Cemetery in Keyesport. Friends may call from 9 a.m. to noon Tuesday at Zieren Day. Memorial contributions are suggested to Greenville Christian Church in memory of Mrs. Harris, and these will be accepted at the funeral home. Condolences may be left online for the family at www.zierenday.com. Evelyn P. Knutt, 89, of Keyesport died Sunday, Oct. 16, 2011, at St. John's Hospital in Springfield. Mrs. Knutt was born May 10, 1922, in Bond County, daughter of Charles and Florence Ward. She was married to Julius "Spank" Sussen, and they divorced. She married James "Shorty" Knutt on Dec 5, 1960, in Murphysboro, and he preceded her in death July 4, 2002. She is survived by three daughters, Lillian Clausen of Springfield, Carole Knutt of Breese, and Jackie Davis of Alton; two sons Charles "Butch" Sussen of Hoffman, and Richard Sussen of Posey; 32 grandchildren; many great-grandchildren; two sisters, Martha Goodall and Melba Donaldson, both of Greenville; and a brother, Donald Ward of Loda. In addition to her husband, she was preceded in death by her parents; two sons, Ronald and Jerry Sussen; and a brother, James Ward. Mrs. Knutt was a nurses' aid at St. Joseph's Hospital in Breese until her retirement, and she enjoyed walking her dog. Services will be held at 10:30 a.m. Tuesday at Zieren-Day Funeral Home in Carlyle. Interment will follow at McKendree Chapel Cemetery in Keyesport. Friends may call from 6 to 8:30 p.m. today and from 8 to 10:30 a.m. Tuesday at the funeral home. Expressions of sympathy in her memory are suggested to the McKendree Chapel Cemetery and will be received at the funeral home. Onnline condolences may be made to the family by visiting www.zierenday.com. Miss Irene Langham, 720 E. Broadway, died at Utlaut Hospital in greenville at 8:15 a.m. today. Born in Keyesport, she was the daughter of William and Sarah M. (Johnston) Langham. 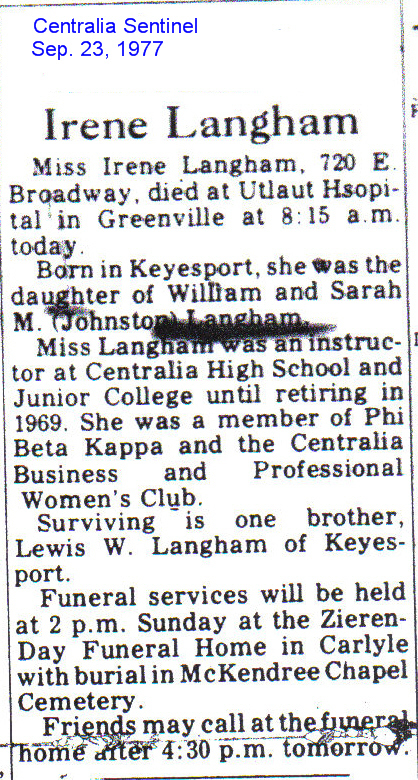 Miss Langham was an instructor at Centralia High School and Junior College until retiring in 1969. She was a member of Phi Beta Kappa and the Centralia Business and Professional Women's Club. Surviving is one brother, Lewis W. Langham of Keyesport. Funeral services will be held at 2 p.m. Sunday at the Zieren-Day Funeral Home in Carlyle with burial in McKendree Chapel Cemetery. Friends may call at the funeral home adfter 4:30 p.m. tomorrow. Wilbur C. Myatt, 78, of Carlyle, died Thursday at St. Louis University Medical Center at St. Louis. 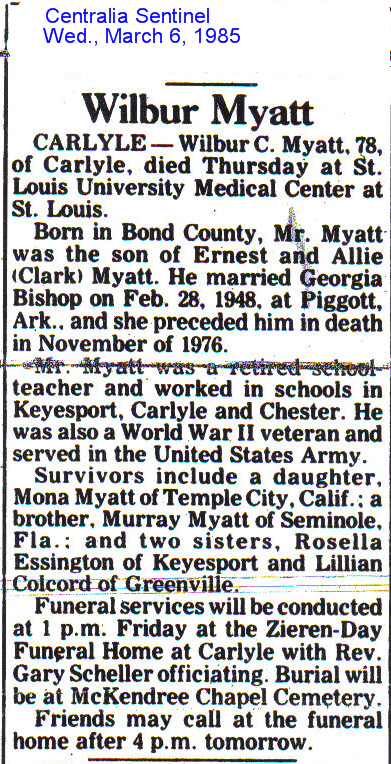 Born in Bond County, Mr. Myatt was the son of Ernest and Allie (Clark) Myatt. He married Georgia Bishop on Feb. 28, 1948, at Piggott, Ark., and she preceded him in death in November of 1976. Mr. Myatt was a retired school teacher and worked in schools in Keyesport, Carlyle and Chester. He was also a World War II veteran and surved in the United States Army. Survivors include a daughter, Mona Myatt of Temple City, Calif.; a brother, Murray Myatt of Seminole, Fla.; and two sisters, Rosella Essington of Keyesport and Lillian Colcord of Greenville. Funeral services will be conducted at 1 p.m. Friday at the Zieren-Day Funeral Home at Carlyle with Rev. Gary Scheller officiating. Burial will be at McKendree Chapel Cemetery. Friends may call at the funeral home after 4 p.m. tomorrow. Florence A. Parmelee, 90, formerly of Keyesport, was found dead at her residence Friday in Jefferson City, Mo. She was born on Nov. 6, 1895, in Keyesport, the daughter of Charles and Ida (Dill) Apple. She was married to Edward Parmelee. Both her parents and husband preceded her in death. Surviving is a sister, Vola Wheritt of Keyesport. 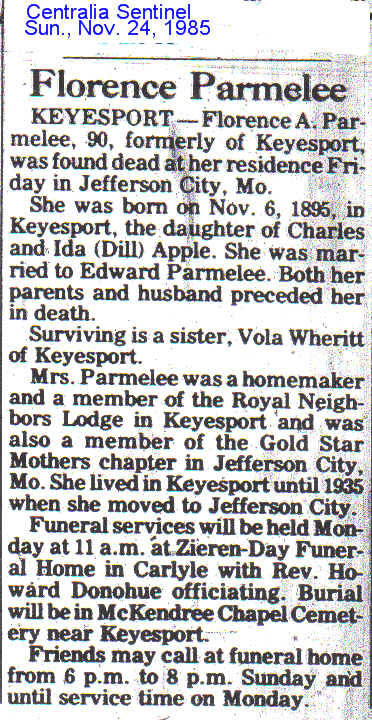 Mrs. Parmelee was a homemaker and a member of the Royal Neighbors Lodge in Keyesport and was also a member of the Gold Star Mothers chapter in Jefferson City, Mo. She lived in Keyesport until 1935 when she moved to Jefferson City. Funeral services will be held Monday at 11 a.m. at Zieren-Day Funeral Home in Carlyle with Rev. Howard Donohue officiating. Burial will be in McKendree Chapel Cemetery near Keyesport. Friends may call at funeral home from 6 p.m. to 8 p.m. Sunday and until service time on Monday. Alfred Edward Reupke, 64, of Carlyle, died Saturday, Dec. 10, 1994, at his home. He was born July 21, 1930, in Clinton County. Mr. Reupke was never married. He is survived by his mother, Frances Stover of Carlyle. 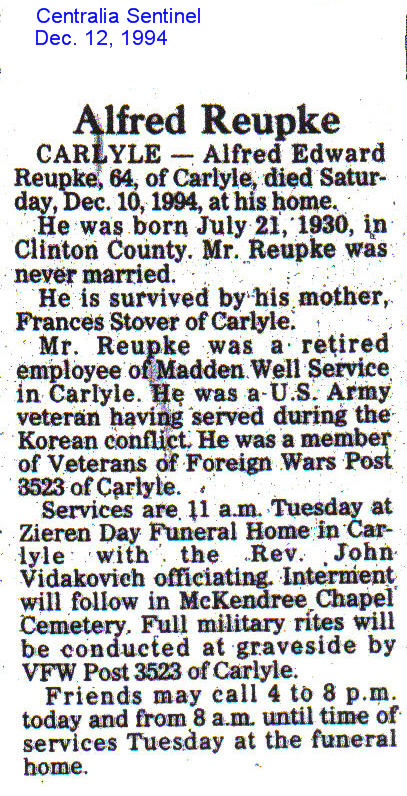 Mr. Reupke was a retired employee of Madden Well Service in Carlyle. He was a U.S. Army veteran having served during the Korean conflict. He was a member of Veterans of Foreign Wars Post 3523 of Carlyle. Services are 11 a.m. Tuesday at Zieren-Day Funeral Home in Carlyle with the Rev. John Vidakovich officiating. Interment will follow in McKendree Chapel Cemetery. Full military rites will be conducted at graveside by VFW Post 3523 of Carlyle. Friends may call 4 to 8 p.m. today and from 8 a.m. until time of services Tuesday at the funeral home. Georgia M. Riddel, 82, died yesterday at Hillview Manor Nursing Home in Greenville. Born in Tomalco township in Bond County, she was the daughter of George and Maude (Ray) Cole. 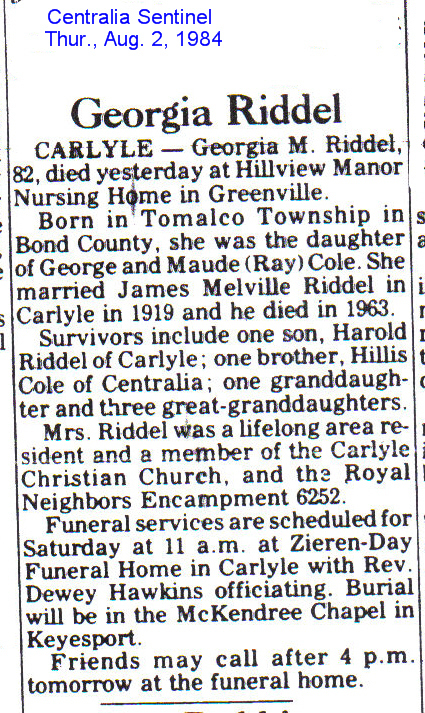 She married James Melville Riddel in Carlyle in 1919 and he died in 1963. Survivors include one son, Harold Riddel of Carlyle; one brother, Hillis Cole of Centralia; one granddaughter and three great-granddaughters. Mrs. Riddel was a lifelong area resident and a member of the Carlyle Christian Church, and the Royal Neighbors Encampment 6252. Funeral services are scheduled for Saturday at 11 a.m. at Zieren-Day Funeral Home in Carlyle with Rev. Dewey Hawkins officiating. Burial will be in the McKendree Chapel in Keyesport. Friends may call after 4 p.m. tomorrow at the funeral home. Mrs. Ava Simonton, 83, formerly of Keyesport, died Saturday evening at St. Joseph's Hospital in Breese. A lifelong Keyesport resident, she had been living with her son near Odin and at the Breese Nursing Home for the last four years. Mrs. Simonton was born in Jasper County, the daughter of Charles and Myrtle Jay. She married John F. Simonton in Greenville on April 27, 1918. He preceded her in death. Surviving are a son, John F. Simonton Jr. of R.R. 1, Odin; a grandson, two great-grandchildren and one great-great-grandson; and sevearl half brothers and half sisters. Mrs. Simonton was a member of the Keyesport Christian Church and of the Sunlight Rebekah Lodge of Keyesport. Rev. Ed Schmulbach will officiate at funeral serfvices at 2 p.m. tomorrow at the United Methodist Church in Keyesport. Interment will follow at the McKendree Chapel Cemetery. Friends may call at the Zieren-Day Funeral Home in Carlyle after 5 p.m. today or until 11 a.m. tomorrow, or at the church from noon tomorrow until time of services. George C. Sohn died on Thursday, December 08, 2011, at Carlyle Healthcare Center in Carlyle. He was 86 years of age [born May 20, 1925]. Funeral services will be held at 1:00 P.M. on Sunday, December 11, 2011, at Zieren Day Funeral Home in Carlyle with Rev. Earl Menchhoffer and Rev. Tom Hoffman, officiating. Interment will follow at McKendree Chapel Cemetery. Visitation will be held at Zieren Day Funeral Home on Saturday, December 10 from 4:00 – 8:00 P.M., and on Sunday from 10:00 A.M. – service time. Expressions of sympathy in memory of Mr. Sohn are suggested to Immanuel United Church of Christ in Carlyle or to Heartland Hospice and will be received at Zieren Day Funeral Home. Roy Vogel, 77, of Keyesport, died at Utlaut Memorial Hospital in Greenville at 7:_5 a.m. Friday. He was born in Irishhtown Township, the son of John and Elizabeth (Nettles) Vogel. In 1920, in Carlyle, he married the former Mabel Lillian Hensley, who survives. Also surviving are two sons, Ralph H. and Robert L., both of Centralia; one brother, Gordon of Carlyle; four sisters, Ruby Golder and Nettie Maibaum, both of Carlyle, Pheba hill and Noreen Barackman, both of Keysport; four grandchildren and three great-grandchildren. Mr. Vogel was a retired Pet Milk Co. employe and was a member of Hopewell Methodist Church. Funeral services will be held at 2 p.m. tomorrow at the Donnel-Wiegand Funeral Home in Greenville with the Rev. Leroy Bula officiating. Burial will be in McKendree Chapel Cemetery. Friends may call at the funeral home after 2 p.m. today. Mrs. Bernice Wade, 85, of rural Carlyle, died yesterday afternoon at the Carlyle Healthcare Center. 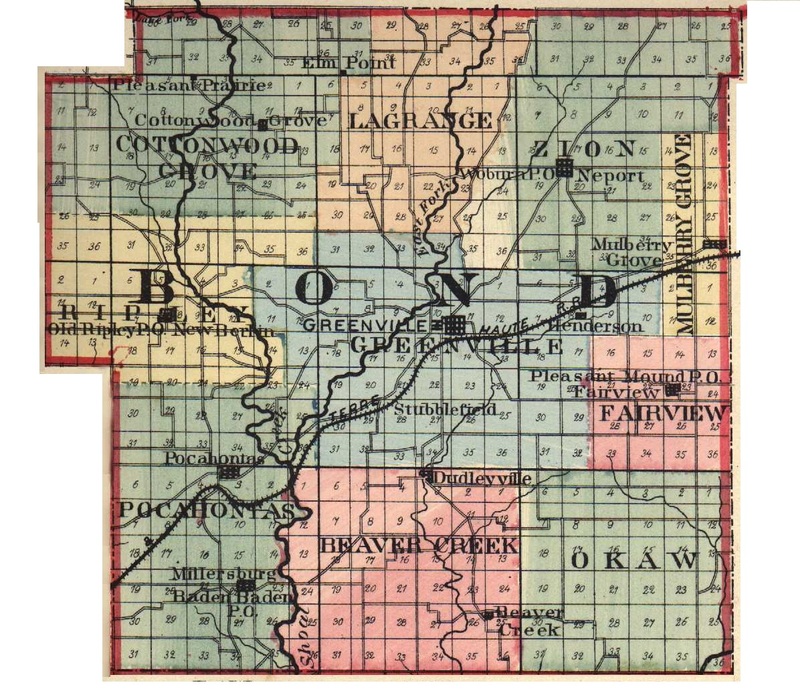 Mrs. Wade was born in Bond County, the daughter of Alphonse and Mary (Sohn) Harnetiaux. She married Albert Wade in 1920 at the Wisetown Baptist Church. He preceded her in death. and Burnell Wade of Joliet; two daughters, Harriet Siebert of Keyesport and Margaret Derrick of O'Fallon, nine grandchildren and 15 great-grandchildren. of the church. She was a housewife and homemaker. Rev. Sam Durham will officiate ... Zeiren-Day Funeral Home in Carlyle at 1:30 p.m. Wednesday. Interment will follow at the McKendree Chapel Cemetery. Friends may call at the funeral home after 1 p.m. tomorrow. Clara B. Wade, 80, of Carlyle, died yesterday at St. Joseph's Hospital in Breese. She was born in Tamalco on Aug. 28, 1905, daughter of William Robert and Mary (Gillespie) Duckworth. In 1925 she married Albert W. Wade and he died in 1973. Survivors include two sons, Warren Wade of Carlyle and Marvin Lee Wade of Salt Lake City, Utah; a brother, Hubert Duckworth of Greenville; 15 grandchildren and 19 great-grandchildren. Mrs. Wade was an in-home health care assistant for BCMW Community Services in Carlyle and a member of the First Christian Church in Carlyle, where funneral services will be held Friday at 11 a.m. with Rev. Alan Kiifner officiating. Burial will be in McKendree Chapel Cemetery. Friends may call at Zieren-Day Funeral Home in Carlyle from 6 to 9 p.m. tomorrow and at the church from 9 a.m. Friday until the services. Memorials may be made to the First Christian Church. They will be received at the funeral home. Robert O. Wade Sr., 53, died Thursday at Penrose Hospital in Colorado Springs, Colo., after an extended illness. He was born in Carlyle, son of William and Clara (Duckworth) Wade. Mr. Wade lived in Centralia from 1940 until 1967. He worked for Automatic Music Co. for 20 years and for the Centralia Post Office for about two years before moving to Colorado Springs. He was a member of the Letter Carriers Union and the Christian Church. Survivors include his mother, Clara of Carlyle; a son, Robert Wade Jr. of Colorado Springs; two daughters, Rebecca Bohnhorst of San Diego, Calif., and Debra Alexander of Colorado Springs; two brothers, Warren Wade of Divide, Colo., and Marvin Wade of Salt Lake City, Utah; and five grandchildren. Funeral services will be held Tuesday at 2 p.m. at Zieren-Day Funeral Home in Carlyle with Rev. Mike Hoke officiating. Burial will be in McKendree Chapel Cemetery. Friends may call at the funeral home after 6 p.m. tomorrow. Bessie Wheritt, 99, former Keyesport resident, died in Hot Springs, S.D., Friday. She had been a resident of Hot Springs for 55 years. She was born in	Irishtown Township, the daughter of Henry and Sarah (Kesner) Reddick. In 1897, in Keyesport she married Louis Edward Wheritt, who preceded her in death in 1941. Mrs. Wheritt is survived by seven daughters, Mrs. Eva Potts of Vernon, Mrs. Lois Potts of Keyesport, Mrs. Marian Vaughn of Spearfish, S.D., Mrs. Verna Miller of Seattle, Wash., Mrs. Grace Smith of Grand Junction, Colo., Mrs. Irma McClelland of Hot Springs, S.D., and Mrs. Lucille Broich of Emmet, Idaho; 14 grandchildren and 30 great-grandchildren. Rev. E. D. Hediger will officiate at funeral services planned for 2 p.m. Wednesday at the Zieren-Day Funeral Home in Carlyle. Interment will be in the McKendree Chapel Cemetery. Lawrence C. Wills, 75, of Carlyle, died yesterday at the Anna Henry Nursing Home at Edwardsville. Born in Grundy County, Mr. Wills was the son of Wesley and Nellie (Carter) Wills. 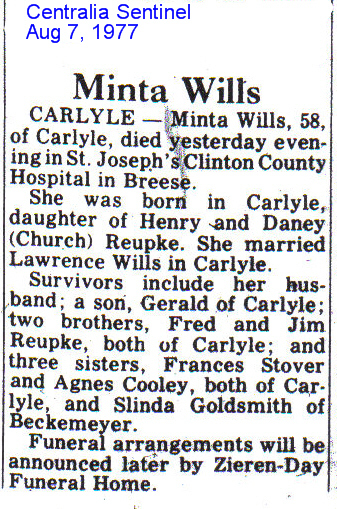 On Dec. 2, 1948, he married Minta Ruepke at Carlyle and she preceded him in death in August of 1977. Survivors include a son, Gerald Wills of Edwardsville; a sister, Margaret Douglas of Coal City; and a brother, Warren Wills of Cambridge, Wis.
Mr. Wills came to Carlyle in 1948 and was a foundry molder and farmer. He was a member of the United Methodist Church at Carlyle and a longtime Sunday School teacher and Bible Class instructor. Funeral services will be held tomorrow at 1 p.m. at the Zieren-Day Funeral Home at Carlyle with Rev. Gary Scheller officiating. Burial will be at McKendree Chapel Cemetery. Friends may call after 5 p.m. today at the funeral home. Minta Wills, 58, of Carlyle, died yesterday evening in St. Joseph's Clinton County Hospital in Breese. 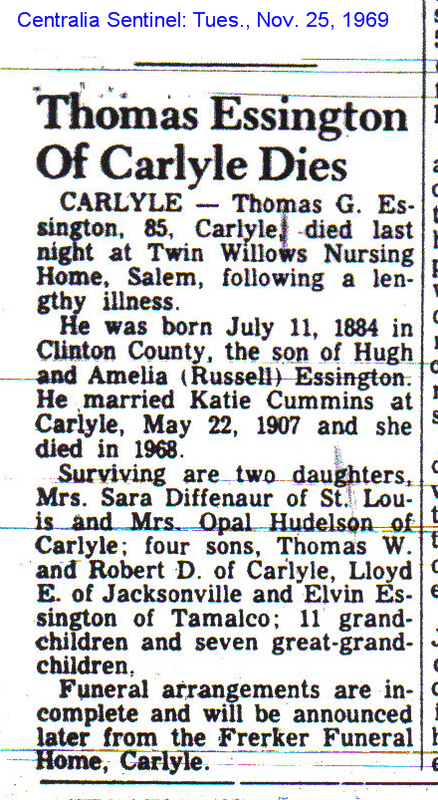 She was born in Carlyle, daughter of Henry and Daney (Church) Reupke. She married Lawrence Wills in Carlyle. Survivors include her husband; a son, Gerald of Carlyle; two brothers, Fred and Jim Reupke, both of Carlyle; and three sisters, Frances Stover and Agnes Cooley, both of Carlyle, and Slinda Goldsmith of Beckemeyer. Funeral arrangements will be announced later by Zieren-Day Funeral Home.